TAO is observations. GODAS is modelling blended with observations, with the primary observations available in this region being TAO (also some ARGO network floats). I prefer TAO. I get the feeling no one has any idea what the enso is going to do later in the year. I doubt it is going to be any La Nina any time soon, but will it remain El Nada or go full El Nino? As does the US Werner. I reckon Australia should also move to proper scientific recognition of the seasons. I think one needs to distinguish between the astronomical seasons (which are responsible for the meteorological seasons) and the meteorological seasons themselves. In my opinion, the meteorological seasons are best defined as they are. I would argue against any attempt to change them. ENSO shows cyclic behaviour with a cycle at 3.7 years, and solar activity at a cycle of 11 years. Three ENSO cycles is 10.6 years - close to the solar cycle length. So look at what happens if you superimpose an average ENSO cycle on an average solar cycle. During the first 50 years the peak of the ENSO cycle seems to be quite consistently low when the solar cycle is at peak. But go forward a hundred years and the relationship is swapping. Studies on larger data sets find that this is the case with el nino and la nina occurring equally at solar peak. An interesting and informative paper. One should always be careful in interpreting apparent patterns. Since the events occur at different frequencies, mathematically it will always keep changing. Looking at that graph, you can see that the relationship between ENSO events and Solar Activity occurs over a 400 year period. ..and move the data by an insignificant couple of months at the front end and it wont look like that at all. These are not 11.0000000 year cycles. I agree. The ENSO cycle is not a regular cycle in the same way as the diurnal and the yearly seasonal cycle. It is complex and (more than a few months out) essentially unpredictable. In fact, I prefer to think of it as a "fluctuation", rather than a "cycle" as the latter term suggests regularity. I see the MJO predictions are now predicting a return to the central Indian Ocean for the next week, after spending the best part of a month in the null state. Pacific trades are typical at the moment, but due to slacken off in the near future, going by Windy. Equatorial cloud remains el nada. .....so more of the same for the next few weeks? A dot here and a .,>, :. there on any input line and who knows what we get anyway right ? Sssshhh don;'t answer, you might change the Weather. Moving away from El Nino towards at least a cool neutral atm for mine and Indian certainly looking better this year than last for better rainfalls across the south. SST from the Pilbara region right through to the entire GOC remain warm given its now mid April. Although nothing is prognosed, I for one expect a late season tropical storm to brew around the Aus NW tropics over the next 10 days or so. Its quite cloudy along the equator in central Indian Ocean right now, SST there (at MJO 2/3) is 31C. I'd say that the 50% of models that predict the MJO to appear in the Indian ocean in a weeks time will be correct. Maybe sets up a "last hurrah" for the Aus tropics in a fortnights time? Enso still seems to be not sure what it wants to do. Does not seem to be any WWB on the horizon to push into El Nino, but their also does not seem to be any push to go back to middle of the road neutral. Looks like just a continuation of the warm neutral conditions. Which to me, supports the 50% of MJO models that forecast the MJO to appear at phase 2/phase 2/3 during next week. The ENSO state is currently like the Cyclone Models and Space Weather threads, just wallowing around in no-mans land. All eyes on the IOD for its influence on the season ahead. BOM not keen on a -ve IOD for coming winter Kino, ....but at least that SST image above looks positive! The waters off the West Coast of AUS are actually cooler than average atm. The next mjo phase looks like a very defining one imo, if has a decent phase around zone 2 we should see warming of our side of the Indian Ocean. Another Ningaloo Nina/IOD will be very tough, really don't want to see it. Why are we on El Nino alert? Am I missing something here? I can't see anything but neutral at this stage. 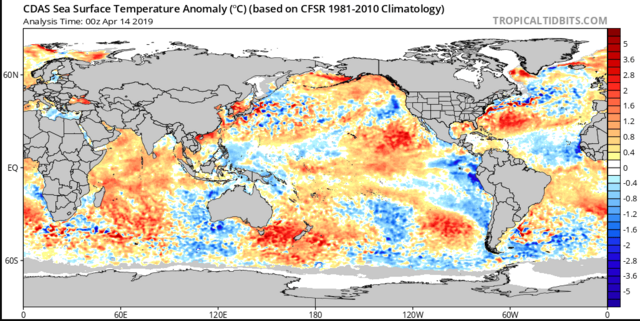 One thing is that Nino3.4 is now more anomalously warmer than Nino.4 for the first time in a long while? For now it's "all eyes on the Indian" for the next couple of months!